Don Draper has a model in his head of what really motivates people. Every person that works in branding, design or social media has their own model of what makes people do what they do. Mine is based on my background in behavioural economics. Economics tells us that we will spend money on things that are important to us and that we value. Even if the motivations for doing so aren’t obvious, even to ourselves. The first blogger that I became truly fascinated with was Rob Horning who writes the Marginal Utility blog about using economics to understand sociology and vice versa. Rob had a wonderful article critiquing the reasons why you might buy a product that no one else would see. It boiled down to curating an identity. For me this was the missing link in understanding why people spend money in ways that are seemingly irrational but remarkably predictable. Your Hyundai would get you from point A to point B, a BMW might impress a few of your friends but a vintage Aston Martin that you keep in the garage and never drive says something about you to yourself. It becomes part of who you are. I worked on the first stages of a product design strategy project for a women’s underwear brand. They knew full well that their competitor’s bras could technically achieve the function needed do the job (although the 3D modelling, load mechanics and engineering involved would surprise you). They also knew that the market for bras to impress men is already pretty crowded. But more importantly, any social desire to impress a man is a gross oversimplification of how women really buy underwear. When you dive deeper you discover that most premium underwear purchases are really made as part of a woman curating her identity. They say things like “I don’t know why, but that brand just felt like the sort of brand that someone like me would wear.” Even when no one else is going to see the product, people still want to buy something that is consistent with how they see themselves. If you have a friend who works outside advertising or social media and is appalled that you would conflate consumption and identity. Then ask them why they buy organic vegetables at Waitrose instead of cheaper glasshouse tomatoes from Tescos. The answer will be “It just feels like the right thing to do”. Like their Birkenstocks (almost ten times the price of flip-flops) the tomatoes are part of how your friend reminds themselves who they are. Anti-consumption is still part of curating a self-image. No doubt the Aston Martin, the premium bra, the organic tomatoes and the Birkenstocks all lay claim to legitimate functional benefits over their commodity substitutes. But the added speed, support, taste and comfort pale in comparison to the added price premiums. People from across all walks of life are willing to invest money into products and services that help them remind themselves what sort of person they are. I’m also not convinced by those to aggressively or condescendingly suggest that these goods are bought for simple show value and are all about keeping up with the Joneses. I love the bra example because in many cases no one else but the wearer will ever see the product. Yet the price premium remains. You choose your brand because it fits who you are (or more interestingly to me, who you want to be). I’ve been forced to re-examine all of these issues by moving to London this year. When you move to a new city you can’t find your favourite brand of beer, olive oil or your favourite brand of business shirt or the shampoo you usually use. Mostly I’ve opted for functional choices in these categories but I’ve been confronted with little decisions at point-of-sale that we all usually make based on habit. Research says that beer and olive oil are habit based purchases where we will probably just buy the brand that our parents used. Or the brand that we chose when we first moved out of home and went flatting. When you move to a new country you have to make all these little daily decisions all over again. I’ve found that Hawes & Curtis business shirts just feel right. They’re better fabric than H&M and better value than Paul Smith. The rational reasons only account for so much. Some of the functional value is in the cool collars that Hawes & Curtis have and the social value is in fun fabrics that I think will connect with clients and friends. But in the end, if I’m honest with myself then I chose the shirts because they fit my model of who I think I am (or want to be). My choices are a small slice of my identity. TM Lewin once held that place for me. 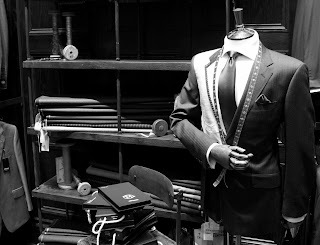 The mix of casually understated social media and standardised but confident in-store merchandising at TM Lewin helped me feel like part of a club of working city professionals. TM Lewin’s community is a sort of unaffectedly slick club of “I forgot to bring a shirt to work today so I bought this one at the last minute on the way into the office”. But the deeper brand connection is the way that I felt when my first mail order delivery of shirts arrived at my office in New Zealand years ago while working as a lawyer. I felt connected to London, to the city, to who I wanted to be. Clothing is an obvious example of Curated Identity but products from all industries and even B2B products can contain a mix of functional, social and identity values. What motivates people is irrational from the outside, but remarkably consistent. This is a very delicate type of branding, social media and design. Tell an accountant buying power tools that he is buying the identity of toughness and resilience and he’ll run a mile. Make the mistake of only selling the functional and miss out while your competitors capture market share and gain higher price premiums by selling him a little slice of an ideal world where he knows how to fix the fence. I’ve found that the best way to meet an identity need is to create strong stories, immersive brand experiences and a sense of community. You need to equip your audience with little tools to weave your story into their own stories. Moleskine notebooks are the masters of this type of DIY identity creation. 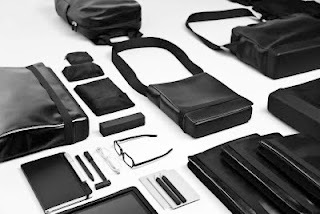 Moleskine have just launched a new range of travel accessories. Their brand stories and social media invite you to create your own versions of what Moleskine means to you. They also sell you a functional benefit of quality paper and the social benefit of unspoken membership in a club of creative professionals. Most importantly they let you remind yourself who you are. 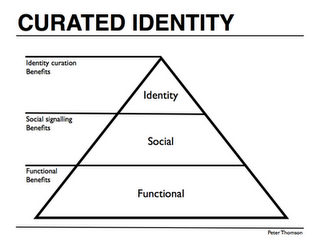 You can use the Curated Identity pyramid to understand what really motivates your audience. Are you communicating with each of the parts of the pyramid? I’ve worked with Technology and Software clients who were so into selling the social benefit (better ROI and profit) that they had forgotten to explain the functional benefit (what the software does). You need to hit all three layers. Behavioural economics teaches us to observe real-world human behaviour and to create models that fit the behaviour. If you are creating a brand, launching a social media campaign or building a business then you can use the Curated Identity model as a checklist to make sure you are communicating in a way that speaks to people’s real underlaying motives. Not just the obvious ones. People tend to do this subconsciously. Most people don’t buy a t-shirt and think to themselves “this defines my identity”. But subconsciously that is probably still what is motivating them.